Well, taking a walk around Angel and Robert's vibrant home is a pretty similar experience. 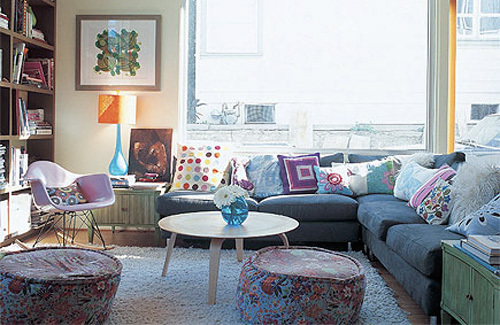 Colourful striped walls, multihued furniture and eclectic accessories are all key to their way of decorating. And you can't help but feel that it must be an incredibly fun way to live. Getting this fabulous family home for their two girls, eight-year-old Georgia and three-year-old Hazel, has taken some serious work, however. Occupying the plot in the Hollywood Hills where their three-bedroom house now stands used to be a compact two-bedroom bungalow. 'At the time it was perfect for us,' recalls Robert. 'We lived in an apartment not far from here and we loved the area. It's sort of a hidden neighbourhood but still within easy walking distance of all the main attractions.' The small bungalow was ideal for the young family of three, but when Angel fell pregnant with Hazel they realised it was time to move on. Decorated with leftover paint from other rooms, the hallway offers a taste of what's to come in the rest of the house. You can buy the RAR rocking chair by Charles Eames from twentytwentyone. Available in several colours, it costs £329. 'We'd already decided that we liked the idea of building our own home so it was just a matter of finding the right plot,' adds Robert. 'Or so we thought!' That seemingly small matter proved to be more difficult than they'd anticipated, and when the sale of a nearby plot fell through, they turned their attention to their existing home. 'After talking with our architect, we realised that we could knock down the small bungalow and, with some clever planning, build a two-storey, three bedroom home in its place,' he adds.